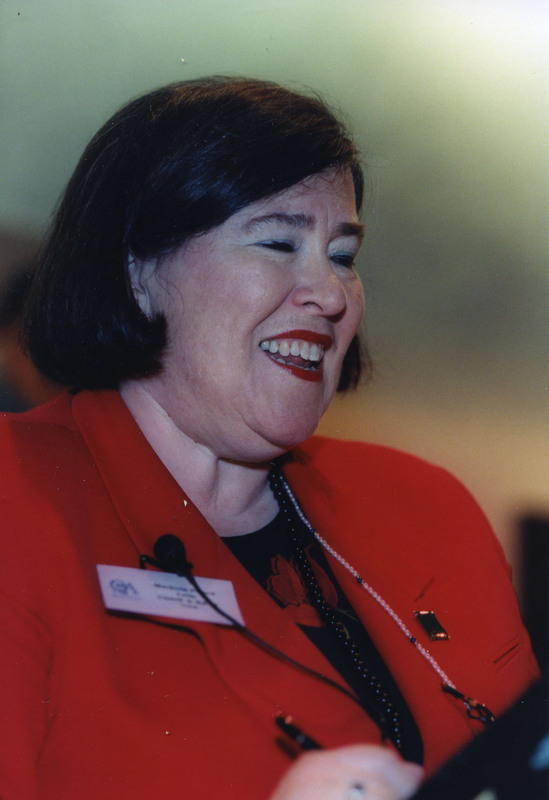 A leader in the global quality assurance movement in higher education, Marjorie Peace Lenn was founding president of the Center for Quality Assurance in International Education (CQAIE). Born in Bowling Green, Ohio, in 1946, and educated at Transylvania University (BA, 1968), Yale (MAR, 1970), and UMass Amherst (MEd and EdD, 1978), Lenn began her career in education as as assistant area director of student life at UMass Amherst, rising over the course of twelve years (1970-1982) to become the Director of Residential Life. From UMass, Lenn went on to senior positions with the Council on Postsecondary Accreditation (1982-1992) before founding the CQAIE in 1991. Throughout her career, Lenn was in high demand internationally as a consultant on quality assurance and accreditation systems. Working with dozens of governments, ministries of education, universities, and intergovernmental agencies such as the World Bank, UNESCO, OECD, Organization of American States, United Nations Development Program, and the Asia Development Bank, she also became an official advisor to the U.S. government on trade in education services as a member of the International Trade Advisory Commission, influencing the development of accreditation infrastructure in Asia, Europe, and the Americas. After a long battle with cancer, Lenn died at home in Alexandria, Va., on Oct. 16, 2010. The Lenn Papers offer rich documentation of the international development of accreditation systems in higher education and the impact of Lenn's ideas on quality assurance. The bulk of the records stem from Lenn's work with the Center for Quality Assurance in International Education and Council on Postsecondary Accreditation, but also reflect her role as advisor to the US government and her varied consultancies. A leader in the global quality assurance movement in higher education, Marjorie Peace Lenn was the founding president of the Center for Quality Assurance in International Education (CQAIE). Born in Bowling Green, Ohio, in 1946, and educated at Transylvania University (BA, 1968), Yale (MAR, 1970), and UMass Amherst (MEd and EdD, 1978), Lenn began her career in education as an assistant area director of student life at UMass Amherst, rising over the course of twelve years (1970-1982) to become the Director of Residential Life. From UMass, Lenn went on to senior positions with the Council on Postsecondary Accreditation (1982-1992) before founding the CQAIE in 1991 to address the need for an organization that would be willing and able to work with international organizations or people on issues in higher education accreditation. Lenn was the driving force in CQAIE for nearly two decades, from 1991 until 2010. Throughout her career, Lenn was in high demand internationally as a consultant on quality assurance and accreditation systems. Working with dozens of governments, ministries of education, universities, and intergovernmental agencies such as the World Bank, UNESCO, OECD, Organization of American States, United Nations Development Program, and the Asia Development Bank, she also became an official advisor to the U.S. government on trade in education services as a member of the International Trade Advisory Commission, influencing the development of accreditation infrastructure in Asia, Europe, and the Americas. Her work took her to over 50 countries, including Romania, Bulgaria, Estonia, Sweden, the United Arab Emirates, Costa Rica, Vietnam, East Timor, Japan, China, Colombia, Chile and Indonesia. As part of her work with the CQAIE to organize higher education organizations around common needs and concerns, Lenn became a key member of the National Committee for International Trade in Education (NCITE), an organization founded in September 1999 to lobby the U.S. government during international trade negotiations. NCITE made its presence known to the federal government almost immediately, advising the U.S. Trade Representative as early as September 15 1999, and later the Department of Commerce at a Roundtable Discussion on trade services, and ultimately being introduced to the international community at the 4th annual GATE conference in Melbourne Australia. Founded to serve as a collective voice for US higher education and training industries in matters relating to international trade negotiations, NCITE sought out meetings with negotiators involved in WTO Ministerials, first among them the Seattle Ministerial, in order to provide information on higher education and information on the interests of the training and higher education communities in relation to international agreements. Among Lenn's most significant accomplishments was the creation of International Recognition in Teacher Education (IRTE) in 2003, which provided an effective accreditation standard and infrastructure for international education. Building on the National Council on Accreditation in Teacher Education (NCATE) standards used in the United States in cooperation with NCATE, Lenn and her colleagues developed the IRTE as a supportive process meant to assist programs in reaching quality standards and it provided support, timetables, and workshops as a way of providing institutions seeking recognition the best chance at success. Like so many of Lenn's other projects, it was first administered by the CQAIE, but ultimately it returned full circle and was rolled into the Council on Accreditation of Education Professionals (CAEP) portfolio when CAEP was formed through the merger of NCATE and the Teacher Educator Accreditation Council. Over her career Lenn wrote, co-wrote, or edited a number of important works on international education and accreditation. After a long battle with cancer, she died at home in Alexandria, Va., on Oct. 16, 2010. Between the late 1980s and 2010 Lenn spent much of professional life working on international quality assurance initiatives and conferences. Lenn's work with the CQAIE from 1991 to 2010 brought together experts in the field to support quality assurance efforts in over 50 countries. Through the CQAIE and GATE Lenn contributed to developing standards for international quality assurance and distributed information on those standards. The collection contains Lenn's correspondence, and numerous documents related to the projects, and operation of the CQAIE and GATE. The collection includes country files for both the CQAIE and GATE detailing international projects from their first involvement with each organization. Also present are limited documents from other organizations Lenn was involved in, including COPA, CHEA, NCITE, and INQAAHE. The Center for Quality Assurance in International Education (CQAIE) was founded in 1991. Lenn was the founding president of the CQAIE and served as the Center's executive director. The CQAIE worked with governments or national systems of higher education throughout the world in developing quality assurance infrastructures for its institutions of higher education. CQAIE also worked on the issue of globalization of the professions and held annual conferences on trade in services with NAFTA, GATS, MERCOSUR, FTAA and similar pacts as primary foci. Lenn and the CQAIE sought to gather expertise, incubate new educational initiatives, support the creation of educational structures, develop professional networks, disseminate information, and design new accreditation processes and systems. By serving as an incubator for new initiatives the CQAIE facilitated the creation of new organizations and programs, which if successful would leave the CQAIE and either join larger organizations, or form their own institutional structure. The CQAIE was a relatively small organization throughout its existence, however its focus on partnership enabled it to exert outsized in influence on higher education accreditation globally. The CQAIE closed its doors in 2011 and transferred some of its projects to the Western Association of Schools and Colleges. The Global Alliance for Transnational Education Ltd. (GATE) was founded in 1996 by Lenn as an alliance of businesses, educators, quality-assurance agencies, governments and intergovernmental organizations. Lenn served as the executive director of GATE. The goal of GATE is to nurture and sustain communication among education and training leaders worldwide. GATE specifically focused on issues involving transnational education, any education where the student is in a different country from the institution administering the course. Transnational education includes distance education and virtual education, among other formats. GATE was founded by an international consortium of corporations, governmental agencies and institutions of higher education dedicated to access and quality of higher education and training across national borders. The organization's objectives are to develop and promulgate principles of good practice and accrediting quality transnational education programs; explore issues facing educational institutions in a global marketplace; provide a forum for corporations, governmental and intergovernmental entities, and educational associations and institutions to discuss education and training issues; access global information about educational systems and trends in technology-driven education; and ensure that transnational education standards keep pace with technological change. In 2003 GATE was transferred to the United States Distance Learning Association. The International Network for Quality Assurance Agencies in Higher Education (INQAAHE) was established in 1991. Lenn was one of the founders of INQAAHE, which was founded through the CQAIE. INQAAHE began with 8 members, today INQAAHE's membership exceeds 250 agencies. INQAAHE's membership consists mostly of quality assurance agencies, but includes other organizations that are active in the theory and practice of quality assurance in higher education. INQAAHE provides a forum for the discussion of global quality assurance issues such as cross-border education, distance education, vocational education, professional education and global higher education. INQAAHE's primary function is to convene quality assurance agencies and provide a forum for discussion, innovation and education. Members use this forum to share resources, ideas, experiences, successes and challenges in order to further develop the quality assurance profession. INQAAHE collects, creates and distributes information on quality assurance in higher education. INQAAHE continues to distribute bulletins, sponsor a research journal and arranges conferences and fora. Lenn attended and presented at several education conferences and workshops each year, including conferences hosted by CQAIE and GATE. Conference files incliuding programs, presentations, articles, travel arrangements, correspoondence, and particpant surveys and feedback. Includes country files for both the Center for Quality Assurance in International Education (CQAIE) and Global Alliance for Transnational Education (GATE) that detail international project in a number of countries around the world. CQAIE provided guidance and support to quality assurance efforts of higher education institutions; ithe Center's international projects included collaborations with China, the United Arab Emirates, Singapore, Cambodia, Malaysia, Australia, Vietnam, Palestine, New Zealand, Madagascar, Afghanistan, Japan, Romania, Belize and Oman, among others. Each international project necessitated the creation of a committee, or team, consisting of international experts on quality assurance, CQAIE staff including Lenn, and experts in the host country. The CQAIE served primarily to advise the host country and its representatives in connecting to international experts, and accessing resources. The CQAIE relied upon host countries to organize their own initiatives. GATE created and administered the Global Alliance for Transnational Education (GATE) certification for quality assurance in higher education. This certification influenced quality assurance practices across the globe, including in Greece, Hong Kong, South Africa and Australia. Correspondence: Benson, B.: Jones R., Lenn J. Correspondence: Bobby C.: Lenn J., Lenn R.
Correspondence: Bobby C.: Leventhal M.
Correspondence: Jones B.: Bal'awi D.
Correspondence: Jones B.: Bobby C., Jones R.
Correspondence: Jones B.: Deupree J. Correspondence: Jones B.: Jones R., Carol B. Correspondence: Jones R.: Bobby C.
Correspondence: Jones R.: Jones B. Correspondence: Jones R.: Lawson C., Bobby C.
Correspondence: Jones R.: Lenn J. Correspondence: Jones R.: Lenn J., Bobby C.
Correspondence: Jones R.: Lenn J., Jones B. Correspondence: Jones B.: Plater W.
Correspondence: Jones R.: Shields J. Correspondence: Lenn M.: Alezandra R.
Correspondence: Lenn M.: Devries R.
Correspondence: Lenn M.: Ekman R.: A. Mellon Found. Correspondence: Lenn M.: Falconer A.: Ford Found. Correspondence: Lenn M.: Forest D.
Correspondence: Lenn M.: Griffin W.
Correspondence: Lenn M.: Johnson M.
Correspondence: Lenn M.: Liying F.
Correspondence: Lenn M.: Marcus L.
Correspondence: Lenn M.: Meikle T.
Correspondence: Lenn M.: Mingyuan G.
Correspondence: Lenn M.: Qi W.
Correspondence: Lenn M.: Shields J. Correspondence: Lenn M.: Wang Z. Council for Higher Education Accreditation: Fact Sheet #6 Important Questions About "Diploma Mills" and "Accreditation Mills"
Does US Higher Education Need A Foreign Policy? GATE: Report, "Trade in Transportational Education Services"
Higher Education Moves Into the Next Century: Lecture Notes, Miller Richard I. International Network for Quality Assurance Agencies in Higher Education (INQAAHE): "Quality Without Frontiers"
Lenn, Marjorie Peace: "The New Technologies and Borderless Higher Education: The Quality Imperative"
Lenn, Marjorie Peace: "Quality Assurance in Higher Education: The Cornerstone of Development"
METI-JETRO: Workshop "The World is Flat"
NAFSA: Report of the Strategic Task Force on Education Abroad: "Securing American's Future: Global Education for a Global Age"
Publications: Lenn, Marjorie Peace: "Ethics and Educational Assessment"; "Quality Assurance and Accreditation in Higher Education in East Asia and the Pacific"
Civil Education Project (CEP): "Brain Gain: Sustaining Young Social Scientists in Post-Communist Countries"
Vietnam: "Background QA Info on Vietnam: ETS: Center"
Vietnam: "Setting Up a Quality Assurance System and Implementing Higher Education Accreditation for Periods 2006-2020"
Gift of Jeff Lenn, 2014. Processed by Carter McClintock and Blake Spitz, 2015. Cite as: Marjorie Peace Lenn Papers (MS 838). Special Collections and University Archives, University of Massachusetts Amherst Libraries.